That’s my flower brick in the upper right hand corner (#1!). Plus, it has a nice symmetry to it, as one of Joan Bruneau’s flower bricks graces the cover and her work has had a huge influence on mine (I apprenticed for her when I was still pretty fresh out of NSCAD). You can view the full section here as a pdf. 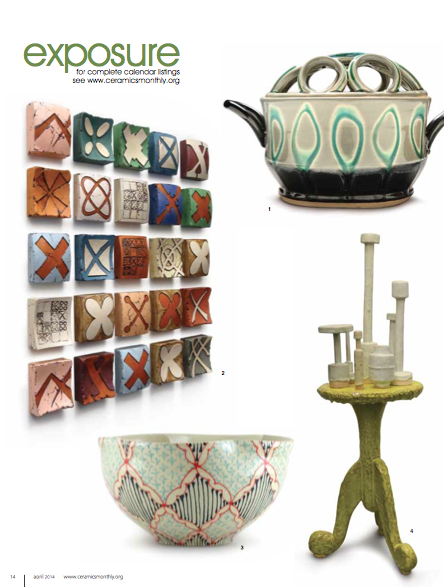 Originally published in April 2014 issue of Ceramics Monthly, page 14. http://www.ceramicsmonthly.org . Copyright, The American Ceramic Society. Reprinted with permission. This entry was posted in News and tagged Archie Bray Institute, Ceramics Montly, Joan Bruneau by naomiclementpotter. Bookmark the permalink.